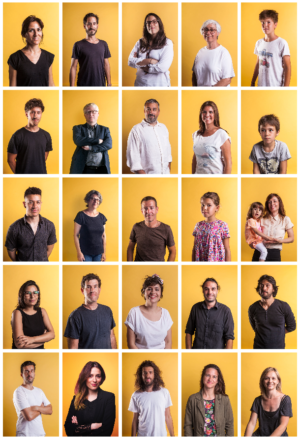 The ‘Botellón no me deja dormir΄ project is a collaborative project co-created by the community of neighbours in Plaça del Sol and technology activists from the project Making Sense EU. A diverse group of people collaborated in order to measure the levels of noise pollution in an attempt to claim a more convivial and inclusive public space. Although Plaça del Sol already counts many years as a meeting place for diverse groups of people who live or visit Barcelona, the situation has significantly got worse. As more tourists and youngsters arrived and bars, restaurants and hotels were extended, the daily life for residents was more and more difficult. In early 2017, a group of technology activists got in touch with the residents, seeking participants for their project Making Sense. They provided residents with the tools to measure noise levels, compare them with officially permissible levels, and therefore, try to reduce noise in the square. More than 40 neighbors signed up and installed 25 sensors on balconies and inside apartments. Figure 1. 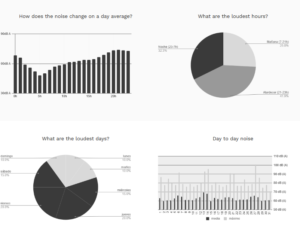 Noise monitoring according to daytime and weekday. Source: Project’s website. Their findings demonstrated that noise levels exceeded norms recommended by both the World Health Organization and municipal guidelines. Through meetings and workshops, neighbours, activists and members of the Barcelona City Council they took some actions in order to mitigate the problem, like fabricating giant totems to represent the neighbours and more. […] neighbourhood activists are really appropriating new technologies into the old-fashioned politics of community development. Data cannot really be explained and used without understanding the contexts in which is arises and gets used. Data can only mobilise people and change things when it becomes thick with social meaning. Making Sense is a Horizon 2020 project, aiming to explore how open source software, open source hardware, digital maker practices and open design can be effectively used by local communities to fabricate their own sensing tools, make sense of their environments and address pressing environmental problems in air, water, soil and sound pollution. This project is also part of the call for CAPSSI – Collective Awareness Platforms for Sustainable Social Innovation. Visit the Making Sense project website. Read the article by Adrian Smith here.